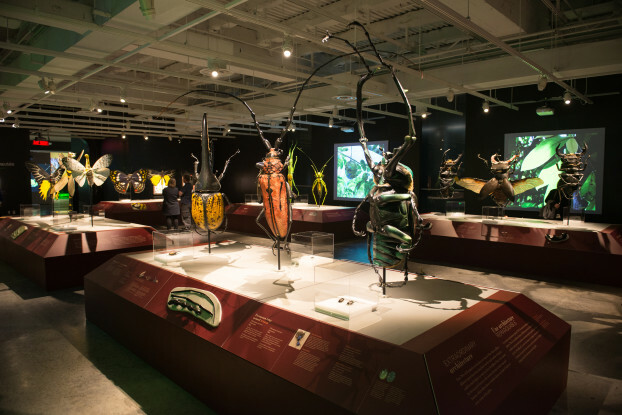 The Canadian Museum of Nature’s “Bugs: Outside the Box” show is a visually impressive large model and hands-on special exhibit intended to reveal and explain the diversity and complexity of insects. There are over one million known insect species on earth, and the exhibit shows over 1,000 of them. Very large and colourful models of a number of “bugs” are the primary focus of the exhibit. Exhibit ‘Bugs: Outside the Box’. Credit: Alex Mcdonald / Canadian Museum of Nature, 2015. The exhibit scales up several beetles, bugs and other insects to larger than human size models created by the Italian sculptor Lorenzo Possenti. 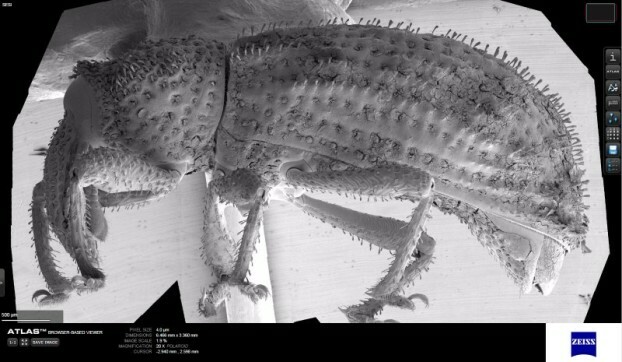 Museum visitors can walk around them and inspect them up close, and with the support of ZEISS and Fibics they even have the opportunity to inspect bugs on a microscopic scale with interactive electron microscopy data. 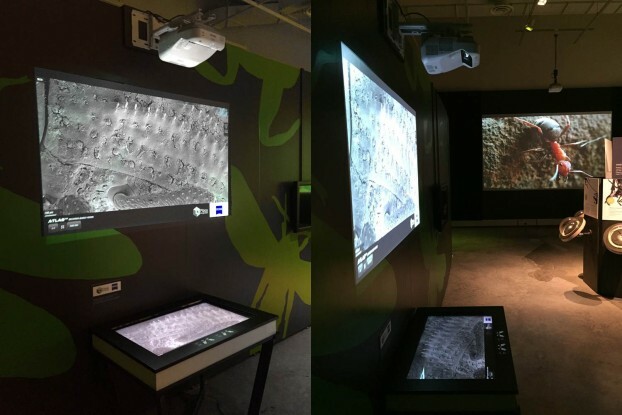 ZEISS Atlas 5 reveals the microscopic side of the insect experience, through the use of a large touch table and simultaneous overhead projection to a screen that allows visitors to zoom in and out of a large area image mosaic of a weevil specimen, created with a ZEISS field emission scanning electron microscope and Atlas 5 software. The interactive station to view electron microscopy data. Credit: Alex Mcdonald / Canadian Museum of Nature, 2015. The partnership of ZEISS and Ottawa-based Fibics Incorporated with the Canadian Museum of Nature began with a previous exhibit earlier this year (Animal Inside Out). That collaboration brought to visitors a way of seeing plastination technology used to reveal animal tissue, nerves and blood vessels alongside large-scale SEM images revealed with the zooming capabilities of ZEISS Atlas 5 technology. More than 100,000 visitors enjoyed the Animal Inside Out exhibit, the largest draw for any special exhibit, in terms of persons per month, in museum history. The Bugs: Outside the Box show opened in late October and will run to the end of March 2016. It already achieved a lot of media coverage including CTV Canada national television news that showed the ZEISS Atlas 5 technology up close. The Canadian Museum of Nature. Credit: Martin Lipman / CMN 2015. The official name of the museum building is the Victoria Memorial Museum Building. Most of the exhibitions and programmes are offered there. 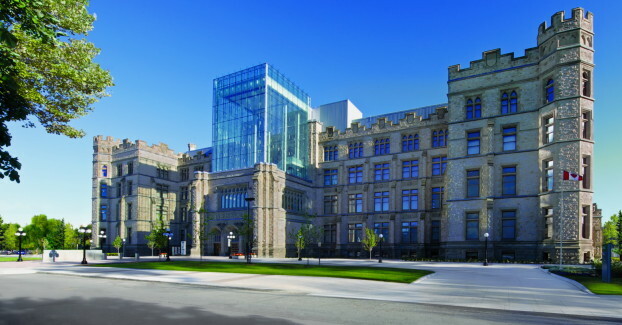 The museum is proud to reside in the first building in Canada created to house a national museum. It’s a national historic site and the birthplace of Canada’s national museums. The site of the research, collections and administrative operations is the Natural Heritage Campus in Gatineau, Quebec. Fibics Incorporated, a privately owned company, is located in Ottawa, Ontario (Canada). Fibics was established by Michael W. Phaneuf, President, in early 1997 with the goal of developing applications of Focused Ion Beam (FIB) microscopy in the fields of Metallurgy and Materials Science. Since acquiring its first FIB in 1997, Fibics in close partnership with ZEISS has developed an international reputation for its work in both metallurgy/materials science, life science, and semiconductor device modification (microsurgery) as well as in TEM specimen preparation, nanomachining/nanofabrication and analysis.